Long ago, deep in the mountains of Shikoku, a husband and wife lived happily alone far away from the nearest village in a small house. In the autumn of one year, the wife of that happy couple fell suddenly ill and was confined to bed. But, because the couple lived so very far away from the nearest doctor in the village, they had no medicine. The wife’s fever grew hotter every day, and the husband could do nothing but cool down her body with cool water. The wife’s condition worsened every day. The husband never left his wife’s side, and tended to her every moment of every day. One day, seeing the pain on his wife’s face, the husband sought to comfort her agony. With that said, the woman relaxed with a peaceful look on her face, and exhaled her last breath. As he had promised, the husband didn’t bury her, but left her as she had died, inside the house, lying in bed. The husband heard these words in a thin voice, but from where they came he could not say. The husband turned his eyes towards the mysterious voice, and saw nothing but the dead body of his wife. With that, the wife spoke no more. Let’s Go Outside, Shall We? After that, two or three days passed uneventfully. But on the evening of the fourth day, a traveling salesman lost his way passing over the mountains while making his way towards the village. Seeing the couple’s remote cottage, he knocked on the door. The traveling salesman had been hoping for some company as well as a place to stay, and was a bit downhearted when the husband left him alone. Sitting in the cottage, he heard a small voice. and she reached out a stark white hand to him. The traveling salesman looked closer at her and saw that she had no feet. With that, he sprang at the woman, grabbed her by the throat and threw her from the house. He stepped to the door to await her challenge, but there was nothing before his eyes. The woman had vanished. After a bit, the husband returned from his errand. The traveling salesman flew into his story of the mysterious encounter. 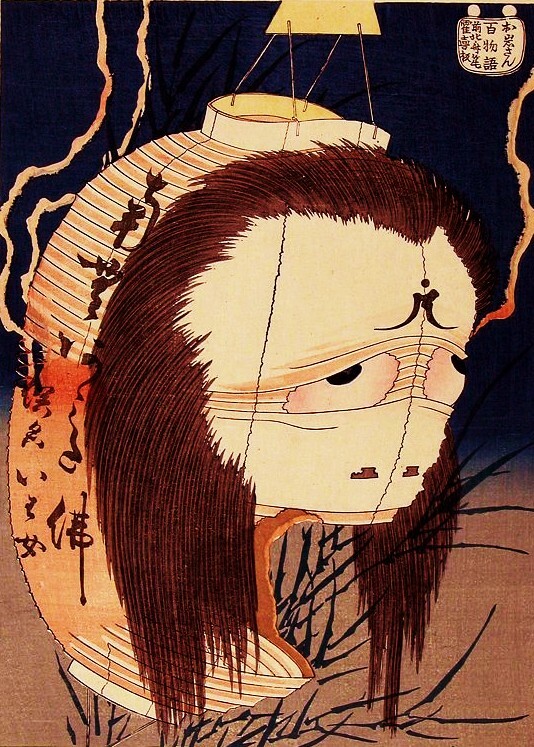 The chastised travelling salesman slowly plodded out the door, and began his task of wandering the dark forest looking for the yurei he had so roughly handled. But even with the bright light of the moon to guide him, the wife was never seen again. This story is sometimes told about a fleeing soldier running from the Heike wars. The legend comes from Shikoku, from Mt. Iya, and for a yurei story has very few variations. It has the nature of a love story, and is a tale of compassion.